Like flying used to be. Without the glamor, of course. We were scheduled to come home on the 3 pm flight, but Gail wanted to get back earlier. I call Alaska Air, and they said we could get on the 10 am flight, but the fees would be over $500, more than we had paid in the first place. Not an attractive offer. Then the agent told me that if I called within 6 hours of the flight time of the new flight, the change fee would be only $25 apiece. That was more like it, but it meant that I had to set my alarm for 5 this morning to call the airline. The things I’ll do for $500. 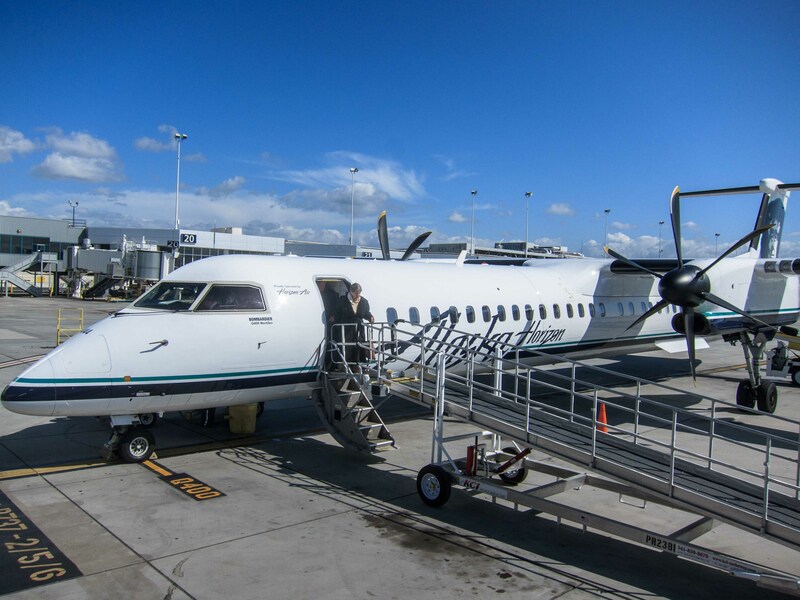 Here is the fun part of this story–our flight home was on a 2 engine turboprop, on Alaska’s subsidiary, Horizon Air. The flight doesn’t take any longer, and it much more enjoyable, at least if you have a window seat. We cruised at 23,000 feet, a full two miles closer to the ground than the jets fly. The view was spectacular, high enough to see the wide vista while low enough to see details. Approach to Oakland took us over Orinda; I got a kick out of seeing the house I grew up in and Miramonte High School. I’m hardly interested in going back to when it took eight hours to fly from St. Louis to Los Angeles, like it did when we moved out here in 1958, but today sure was fun.